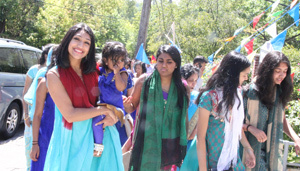 Although small in number, the Youth League at St. Mary’s White Plains has always taken the initiative to get involved in various activities; whether it is within the church itself or taking it upon themselves to go out of the Indian community in order to give back to the community in which they live. A large number of our youth have taken a major step in our own church and have become altar assistants. Within our own church the youth has taken a role in the door to door Christmas caroling. The youth takes an enormous amount of leadership when it comes to giving back to their parents. On Mother’s day, the youth usually gives roses to the mothers within our church. For father’s day, our youth usually gets a cake. Within the past few years, our youth league has taken on major responsibility in order to help the community in which they live. Examples of things done by the youth league are things such as helping out at soup kitchens, clothing drives; canned food drives; helping out at nursing homes; Thanksgiving Day drive. Our youth league has also taken part in what was called Splashes of Hope. This was a project in which our youth came together and painted tiles for a children’s hospital. We took part in an event known as Relay For Life. This is a walk to help fight breast cancer. All proceeds from this event go towards cancer research and the search for a cure. For the past two to three years we have contributed money to March of Dimes. However, St. Mary’s youth league has also made an effort to get involved with things that took place within the church as well. In 2005, the youth league hosted Passion for Fashion. It was a fashion show in which youth from St Mary’s White Plains as well as other youth from the surrounding parishes came together and put on an outstanding performance. St. Mary’s White Plains hosted the MGOCSM Christmas potluck dinner one year and it was a huge success. The youth league has become increasingly more active within our own church; and within other churches as well, and it has been noticed. We take part in monthly bible studies. This takes place at least once a month at various churches in the area. We have taken part in the joint Christmas celebrations of the Bronx/Westchester area. It just goes to show that no matter what the size of the youth is; there is always some way to get involved.